Background: Noise annoyance and effects on academic performance have been investigated for primary and secondary school students but comparatively little work has been conducted with university students who generally spend more time in dormitories or accommodation for their self-study. Objective: To determine, using a socio-acoustic approach involving face-to-face interviews and actual noise measurements, the effect of various community noise sources on student activities in accommodation both inside and outside a university precinct and also relationships with cumulative grade point average (GPA). Materials and Methods: The study sample comprised a student group resident off-campus (n = 450) and a control group resident in dormitories on-campus (n = 336). Noise levels [LA (dB)] were measured at both locations according to International Organization for Standardization standards. The extent of community noise interference with the student activities was examined with bivariate and stratified analyses and results presented as Mantel–Haenszel weighted odds ratios (ORMH) with 95% confidence intervals. Binary logistic regression was employed to assess the association between noise-disturbed student activities and dichotomized GPA values and derive odds ratios (ORs) for these associations. Results: Measured noise levels were all significantly (P < 0.05) higher for off-campus students. This was not reflected in the interviewed students’ subjective perceptions of how “noisy” their respective environments were. The off-campus student cohort was, however, more annoyed by all community noise categories (P < 0.001) except road traffic noise. For impact on specific student activities, the largest differences between on- and off-campus students were found for telephone and personal communication regardless of the type of community noise. 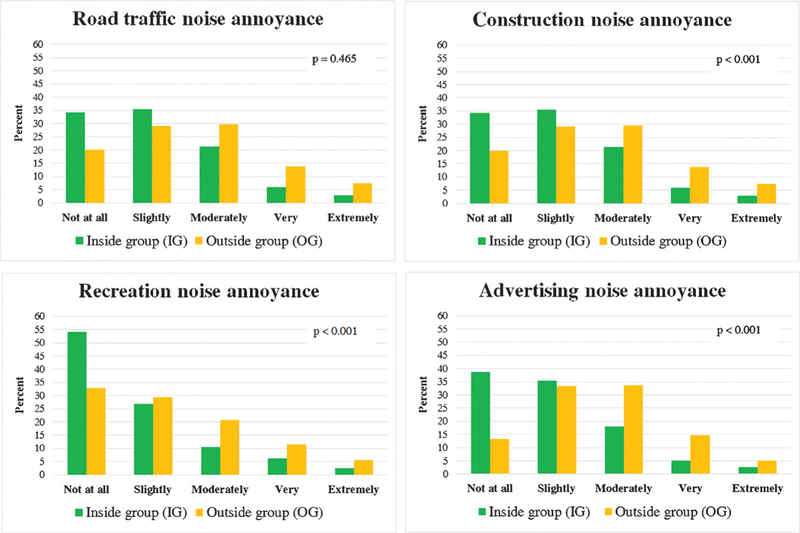 There was no significant difference in the relationships between perceived annoyance due to community noise categories and cumulative GPA in the off-campus group compared to those for on-campus residents with ORMH values ranging from 1.049 to 1.164. The most important noise-impacted factors affecting off-campus students’ cumulative GPA were reading and mental tasks (OR = 2.801). Rest disturbance had a positive influence on cumulative GPA for on-campus students. Conclusion: These results provide support that various contemporary community noise sources affect university students’ activities and possibly influence their educational achievement as well. Introduction: The effect of a sound reinforcement system, in terms of speech intelligibility, has been systematically determined under realistic conditions. Different combinations of ambient and reverberant conditions representative of a classroom environment have been investigated. 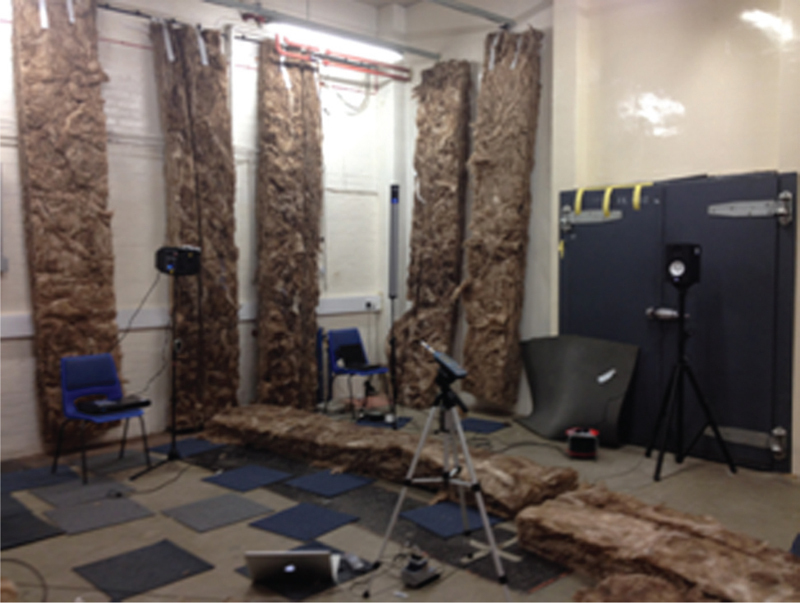 Materials and Methods: By comparing the measured speech transmission index metric with and without the system in the same space under different room acoustics conditions, it was possible to determine when the system was most effective. A new simple criterion, equivalent noise reduction (ENR), was introduced to determine the effectiveness of the sound reinforcement system which can be used to predict the speech transmission index based on the ambient sound pressure and reverberation time with and without amplification. Results: This criterion had a correlation, R2 > 0.97. It was found that sound reinforcement provided no benefit if the competing noise level was less than 40 dBA. However, the maximum benefit of such a system was equivalent to a 7.7 dBA noise reduction. Conclusion: Using the ENR model, it would be possible to determine the suitability of implementing sound reinforcement systems in any room, thus providing a tool to determine if natural acoustic treatment or sound field amplification would be of most benefit to the occupants of any particular room. Context: The willingness of a person to accept noise while listening to speech can be measured using the acceptable noise level (ANL) test. Individuals with poor ANL are unlikely to become successful hearing aid users. Hence, it is important to enhance the individual’s ability to accept noise levels. The current study was an attempt to investigate whether systematic desensitization training can improve the ANL in individuals having high ANL. Aims: To investigate the effect of systematic desensitization training on ANLs in individuals with normal hearing sensitivity. Settings and Design: Observational study design. Materials and Methods: Thirty-eight normally hearing adults within the age range of 18–25 years participated in the study. Initially, baseline ANL was measured for all participants. Based on the baseline ANL, participants were categorized into three groups; low ANL, mid ANL, and high ANL. The participants with high ANL were trained using systematic desensitization procedure whereas, individuals with low and mid ANL did not undergo any training and served as the comparison groups. After the training period, ANL was measured again for all the participants. Statistical Analysis Used: Repeated measures of analysis of variance with follow up paired "t" test. Results: Analysis revealed a significant main effect of systematic desensitization training on ANL. 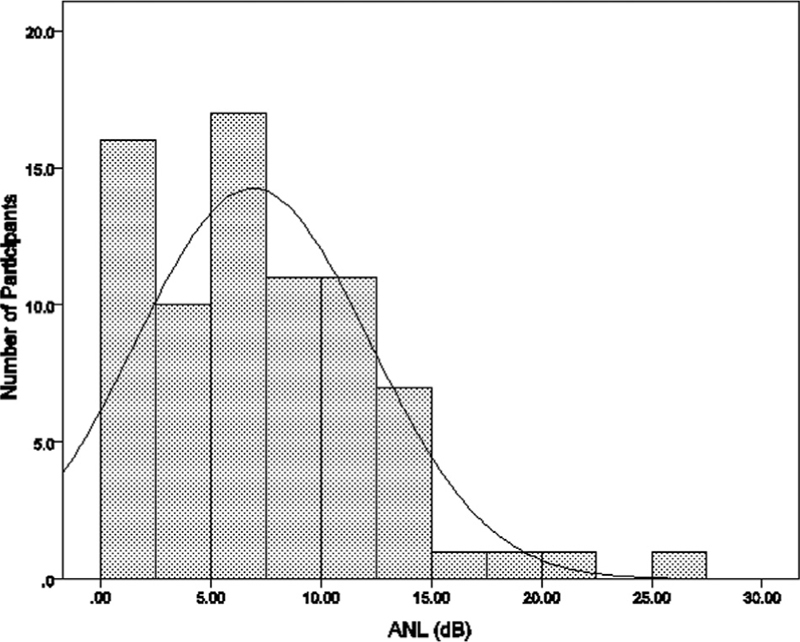 There was a significant improvement in ANL in participants with high ANL. However, there was no significant difference in ANL between baseline and follow-up session in individuals with low and mid ANL. Conclusions: Systematic desensitization training can facilitate ANL, thereby enhancing the individual’s ability to accept the noise levels. This enhanced ANL can facilitate better hearing aid fitting and acceptance. Introduction: This paper describes an assessment of noise caused by railway traffic in a large high-loaded railway track in Northwest Slovakia. Materials and Methods: The measurements of noise levels generated by trains passing through residential neighborhoods were taken. Noise maps were also calculated showing noise pollution generated by the train traffic. In addition, the annoyance level and sleep disturbance of residents affected by railway noise were evaluated by a validated questionnaire on a pilot sample of 107 respondents living near the important railway track. Results: The measurements indicated that the noise levels generated by the passage of the train were extremely high especially at night, clearly exceeding the nighttime limits of equivalent sound pressure level established by the Decree of the Slovak Ministry of Health (No.549/2007) (LAeq = 55 dB). Measurements at one point during the night exceeded the limit values of up to 17.4 dB. The residents reported feeling affected by the noise generated by passing trains, which caused irritability, headache, poor concentration, and insomnia. In addition, 19.64% of the residents claimed that nocturnal noise pollution was the most distressing. The results of bivariate analysis showed a higher risk of annoyance especially for railway noise [ORMH = 7.80 (4.02–15.14)] and the noise from industry [ORMH = 3.08 (1.72–5.50)] in the exposed location. Discussion: The effects of railway traffic on annoyance/sleep and psychosocial well-being were evaluated in a few studies. In accordance with our results the railway noise mostly disturbs sleep and rest of the respondents. Conclusion: The pilot survey showed the importance of sleep and rest disturbance by railway noise and the possibilities of getting worse health condition in the future. Noise abatement measures and strategies should, therefore, be implemented in an effective and manageable way increasing the environmental advantages of rail transport. 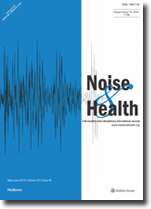 Aim: The aim of the present study was to explore the possible utility of otoacoustic emissions (OAEs) and efferent system strength to determine vulnerability to noise exposure in a clinical setting. Materials and Methods: The study group comprised 344 volunteers who had just begun mandatory basic training as Hellenic Corps Officers Military Academy cadets. Pure-tone audiograms were obtained on both ears. Participants were also subjected to diagnostic transient-evoked otoacoustic emissions (TEOAEs). Finally, they were all tested for efferent function through the suppression of TEOAEs with contralateral noise. Following baseline evaluation, all cadets fired 10 rounds using a 7.62 mm Heckler & Koch G3A3 assault rifle while lying down in prone position. Immediately after exposure to gunfire noise and no later than 10 h, all participants completed an identical protocol for a second time, which was then repeated a third time, 30 days later. Results: The data showed that after the firing drill, 280 participants suffered a temporary threshold shift (TTS) (468 ears), while in the third evaluation conducted 30 days after exposure, 142 of these ears still presented a threshold shift compared to the baseline evaluation [permanent threshold shift (PTS) ears]. 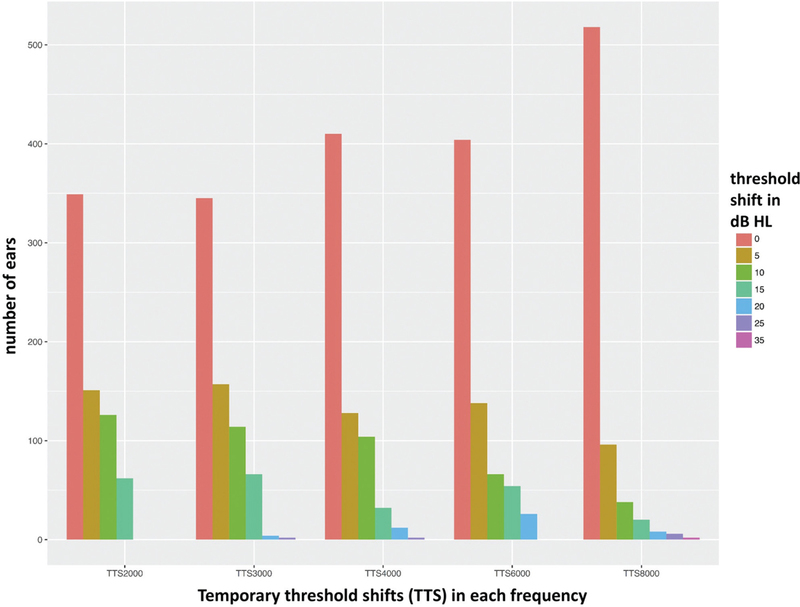 A receiver operating characteristics curve analysis showed that OAEs amplitude is predictive of future TTS and PTS. The results were slightly different for the suppression of OAEs showing only a slight trend toward significance. The curves were used to determine cut points to evaluate the likelihood of TTS/PTS for OAEs amplitude in the baseline evaluation. Decision limits yielding 71.6% sensitivity were 12.45 dB SPL with 63.8% specificity for PTS, and 50% sensitivity were 12.35 dB SPL with 68.2% specificity for TTS. Conclusions: Interestingly, the above data yielded tentative evidence to suggest that OAEs amplitude is both sensitive and specific enough to efficiently identify participants who are particularly susceptible to hearing loss caused by impulse noise generated by firearms. Hearing conservation programs may therefore want to consider including such tests in their routine. As far as efferent strength is concerned, we feel that further research is due, before implementing the suppression of OAEs in hearing conservations programs in a similar manner. Introduction: This study aimed to analyze and compare four different types of earplugs, divided into premolded plugs and foam plug models, in relation to the level of attenuation, comfort, and the size of the external acoustic meatus (EAM) in an attempt to identify how these variables influence the choice of specific hearing protection devices (HPDs). Materials and Methods: A cross-sectional observational study was performed in a sample of 49 participants, oriented toward the ideal placement of four HPDs, two premolded and two foam plugs (3M™). The procedures included otoscopy, EAM diameter measurement using an otometer, EAM volume measurement via an acoustic impedance test, and the obtainment of the bilateral personal attenuation rating (PAR) for each HPD using the E-A-Rfit™ Validation System (3M™). The Bipolar Comfort Rating Scale (BCRS) instrument was applied twice for each individual: once after the evaluations with the premolded HPDs and again after the evaluations with the foam plug HPDs. Then, each participant was asked which was his/her favorite protector. Results: The volume of the EAM was not directly related to the diameter of the EAM. The attenuation did not interfere with the HPD preference, and the PAR of the foam plug was significantly higher regardless of the preferred HPD. Regarding the BCRS, the variables “Placement,” “Complexity,” and “Occlusion Effect” had higher scores for premolded HPDs and had a direct relationship with the type of preferred HPD. Conclusion: Attention to the use of HPDs should be personalized, taking into account the needs of each individual, considering not only the attenuation, but also the user’s reported well-being.